If finalized, NOAA’s proposed rules will open up federal waters to finfish aquaculture for the first time. To proponents like Sims, it represents the success of reason over fear. But to some environmentalists, it is a rash decision that could damage a Gulf already suffering from a spate of misfortunes, from hurricane damage to the 2010 Deepwater Horizon disaster. In part, the debate stems from perspective. Should the ocean be farmed like the land, with fish instead of livestock? And if so, how sustainable is sustainable enough? Officials at NOAA’s National Marine Fisheries Service said the growing U.S. population forces action. The vast majority of seafood Americans eat comes from other countries — and as often as not, it’s farmed. Through its Velella Project, Kampachi Farms uses Aquapods like this one to test out new ways to farm fish in the open ocean. Photo courtesy of NOAA. It’s an uphill battle. The Gulf of Mexico Fishery Management Council first approved an aquaculture plan in 2009 and sent it to NOAA to implement and create regulations. Amid lawsuits and congressional opposition, the policy languished. NOAA finally proposed regulations to implement the plan earlier this year and recently reopened the comment period through Nov. 28. This time, opposition — while still present — is noticeably more subdued. Some environmental organizations have moved on to other priorities; others have tempered their opinions. Beyond the ideological debate is a legal one. Does NMFS have the statutory authority to oversee aquaculture? NMFS sees it as a form of fishing, consequently falling under the nation’s top fisheries law, the Magnuson-Stevens Fishery Conservation and Management Act. 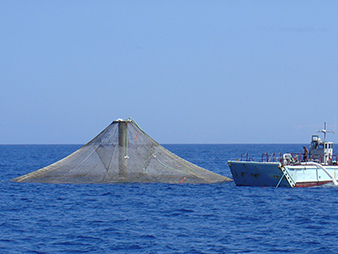 In its proposed rule to implement the Gulf plan, the agency cites the Magnuson definition of fishing as “the catching, taking or harvesting of fish.” Then it turns to the Merriam-Webster Dictionary to back up its assertion that aquaculture qualifies as harvesting — “the act or process of gathering a crop” — and thus is fishing. Environmentalists and food safety groups don’t see it that way. They argue that Magnuson was set up for wild fisheries and does not apply to what is essentially agriculture on the sea. Cufone, who once worked for Food and Water Watch, pointed to a list of risks, including fish escapes and pollution. The Center for Food Safety is on the same side of the debate, releasing a report last month that tallies up the problems in aquaculture around the globe, including farms losing more than 24 million fish (Greenwire, Oct. 21). Their view is partly one of food safety: Finfish aquaculture, the groups contend, is not good for consumers. The industry cannot completely control the inputs in farms open to the sea, for one. Farmed fish are also currently fed wild fish, which threatens wild populations. But the Ocean Conservancy takes a more nuanced view. Though NOAA shouldn’t be moving forward with a piecemeal plan in the Gulf, Leonard said, the United States should develop a nationwide plan for how the country will implement aquaculture. Such a framework could map out farm locations, set environmental safeguards and lay out industry expectations. The problem: Congress, so far, has shown little interest. Bills to establish a regulatory system have failed to gain any real momentum in the past. “We spent four years or so trying to articulate the national standards we thought were appropriate,” Leonard said. “We couldn’t get the political support to pass that, and part of that is because it’s just not high on Congress’ priorities list, and the other part is there’s quite a lot of disagreement” among stakeholders. Don Kent, president of Hubbs-SeaWorld Research Institute, said he has become “cynical” about the prospect of a national framework, particularly before a U.S. industry exists. “These people who say we need a grand plan, what they’re really saying is, ‘Let’s just put this onerous thing out there that has to be done first,'” Kent said. In Kent’s view, NOAA’s Gulf plan is a good, albeit imperfect, first step. But he also acknowledged that it was a “little cumbersome” because of the agency’s adherence to a fisheries law designed to manage wild stocks of fish. Broadly, the Gulf’s Fishery Management Plan for Regulating Offshore Aquaculture would set up a permitting system for aquaculture, effective for 10 years and then renewable in five-year increments. Permit holders would be allowed to maintain an offshore facility, as well as a hatchery. Species would be limited to those that are native to the Gulf and managed by the region’s fishery management council — a requirement designed to limit the effect of potential escapes. Farms also would be prohibited in protected areas and required to be no closer than 1.6 nautical miles from another farm. The proposed rule also sets standards for when farms have to report everything from fish escapes to marine mammal entanglements. Cufone said such restrictions don’t eliminate the inherent danger in fish farms. On the opposite end of the spectrum is Kampachi Farms’ Sims. With an Aussie accent and enthusiasm that reaches across phone lines, he is a fitting spokesman for the finfish aquaculture movement. Sims began raising yellowtail off Kona, Hawaii, in 2005, aiming to prove the industry could be environmentally friendly. He sold the farm in 2009, during an unprofitable year. Today, he co-owns a farm in Mexican waters — drawn, he said, by a more supportive government. A net pen at Kona Blue Water Farms houses yellowtail snapper off Hawaii’s shores. The farm is now owned by Blue Ocean Mariculture. Photo courtesy of NOAA. But he contends that the Hawaiian farm, now owned by Blue Ocean Mariculture, demonstrated that fish farms can be sustainable. The Gulf, he said, is another opportunity to showcase the industry’s potential. Sims has continued testing out fish farm technologies in federal waters off Hawaii, getting one-year federal permits for a small-scale cage that houses about 2,000 fish. The Velella Project has tried unanchored cages, towed by a 65-foot schooner. The aim was to try out a way to minimize the effect of such free-drifting farms on the environment, with the mass of fish constantly moving in deep waters. Sims asserts that biologically it was successful, with more fish surviving and less impact. Now his research team is testing ways to automate feeding in order to lessen the at-sea footprint. But Sims also argues that deep-ocean fish farms have already proved their environmental safety. He and other supporters point to a 2013 technical memorandum from NOAA that puts deepwater aquaculture in a mostly positive light. Citing data on fish farms, the paper provides guidelines for minimizing negative effects. With more than 100,000 fish in a cage, for example, nitrogen and phosphorus can build up. But the NOAA paper concludes that there are “no measurable effects 30 meters beyond the cages when farms are sited in well-flushed waters.” In other words, farms in deep waters with a current are better than those near shore. The paper also addresses concerns over chemicals, citing data that show marine fish farms have drastically reduced their use of antibiotics, therapeutants and anti-foulants in favor of vaccines and better management. But some environmentalists — who contend that such pollution is still a concern — said finfish aquaculture is also not a solution to ramping up the world’s seafood supply. That’s because farmed fish are fed wild fish. One kilogram of the yellowtail farmed by Blue Ocean Mariculture, for example, takes 2.3 kilograms of wild fish meal and fish oil. Fish farmers said technology is still advancing on fish feed, pointing to soy as a potential replacement. Sims said he has been testing out a diet based on soy that eliminates fish meal from the diet of yellowtail snapper. The quality of the resulting fillets is indistinguishable — at least according to him and his employees, who do their own taste tests. The Center for Food Safety’s October report — co-written by Bunin — declares soy “unsuitable fish feed.” Not only is it not natural to the marine environment, Bunin said, but it is also not easily digestible for fish. So what’s the solution to the United States’ well-known “seafood deficit”? Americans import as much as 90 percent of their seafood. While some of that is re-imported American seafood, thanks to a convoluted trade, most admit that as the country’s population grows, wild seafood cannot support its appetite. NOAA’s solution is testing out the possibility of sustainable open ocean aquaculture. But Cufone of the Recirculating Farms Coalition argues that land-based, closed-system aquaculture is the answer, at least in part. Her group advocates for “recirculating” aquaculture, where fish are raised in tanks and their waste is used to fertilize crops. Such systems can run on renewable energy, like solar, and be built in urban environments. 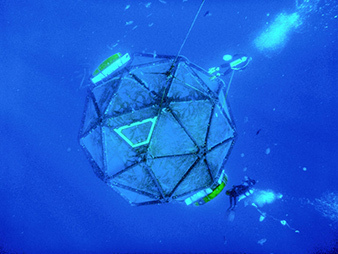 Whether the United States embraces that approach, ocean aquaculture or another future technique remains to be seen. But even if NOAA fails to expand federal waters aquaculture under its watch, the industry may move forward without it. Thanks to a quirk in federal laws, commercial aquaculture farms can bypass NOAA and obtain permits from the Army Corps of Engineers if they farm fish that aren’t federally managed. O’Brien said two commercial operations recently went through that process to receive the first-ever permits for aquaculture in federal waters, albeit for shellfish, which are less controversial than finfish. Kent of Hubbs-SeaWorld has also begun going through that process. He plans to raise yellowtail snapper off California, in federal waters, using the regulations that exist today.